Want to bring all the birds to the yard? Even beginner potters can manage this simple ceramic bird feeder project. Decorate it with glazes and ribbon for a truly unique DIY. Hang it from a tree in your yard, fill it with bird seed and enjoy! The first stage in the process will be wedging a small ball of clay and making sure all of the air bubbles have been removed from the clay. When you've finished wedging, if you ran a wire through the ball, you should be able to see no air bubbles at all. Making sure there are no air bubbles ensures that the ware will not crack in the kiln when it's fired. Once the clay is prepped and ready to use, run a wire down the middle to make two identical balls of clay of a similar weight. Smooth them over and shape them into two balls of the same size, to get them ready to make two matching pinch pots. The two balls should be as evenly weighted as possible. The next step is to make two pinch pots. A pinch pot is one of the most important techniques to learn in ceramic hand building and is also one of the easiest, most tactile and most effective things to create. Once the ball of clay is smooth and round, hold it in your right hand and push your thumb into the center, leaving around one centimeter at the bottom as a base. From here, everyone's technique is slightly different, so you can play around to find out what feels best for you. For example, you can turn your pot slowly with one hand, while pinching with your opposite hand or you could use both thumbs if it feels more natural. Make sure that both of your pinch pots are as identical as possible and the widths of the walls and the base are the same. When they're ready, you'll need to slip and score them to be joined. To create slip, you'll just need to mix some soft clay (use the same clay that you have used to make your pinch pots) with a little water. Score the tops of your pinch pots (try not to make the tops too thin, so you can easily join the two halves together). Then apply to slip with a small brush to the scored clay. Once the tops of your two pinch pots have been carefully slipped and scored, it's time to join the two pots together. Hold them together for around a minute to ensure they are firmly stuck together and then start blending the joins with your thumb to smooth and strengthen them. Spend some time smoothing out the surface. It can help to put the ware on a turntable to work on it, so you can work evenly on each side. Wooden tools are the best for smoothing out the surface, for example, you can use the curved edge of a wooden rib, just try not to gouge out any of the clay when you're working on it. You could also use a flat wooden spatula to gently tap the clay to smooth it out. As soon as the clay is as smooth as you can get it, then it's time to make a semi circular hole in the pot for the birds to get into. Make one clean confident cut with a knife, then take a smooth sponge to run around the edges, so it's as neat and smooth as possible. The final stage in the clay process will be adding the handle. Here you can be creative as you like and create whatever kind of handle you fancy. For a simple sturdy handle (like the one pictured), which will allow to you thread through some rope and hang your bird feeder from a tree, you'll just need to roll out a sausage of clay. Make sure it's thick enough to take the weight of the bird feeder and then curve it round with your fingers. Slip and score each end of the handle and slip and score the exact point on the top of the bird feeder, which it will join to. Then leave the whole ware to dry to leather hard. The ceramic bird feeder will then be ready for bisque firing. Once it's bisque fired and cooled, you get to pick whatever color you fancy, from bright block colors to patterns. You could even paint birds on if you're feeling creative! 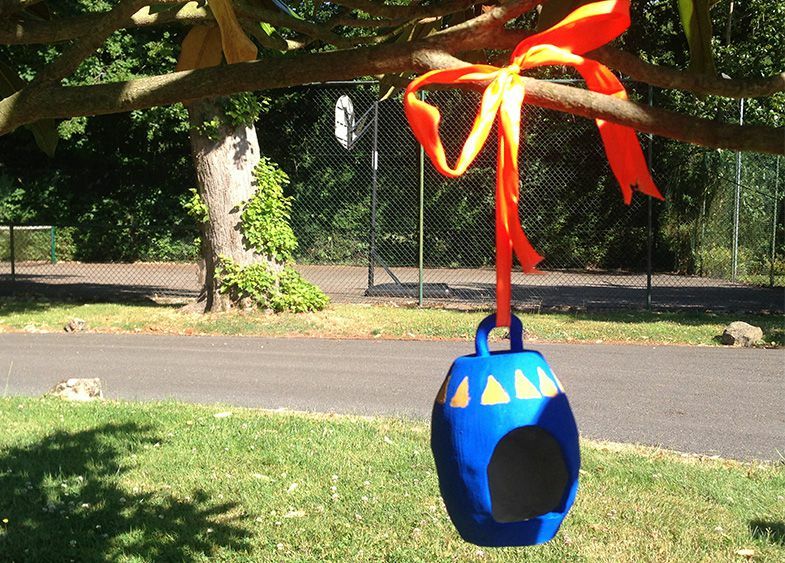 Here I have used underglazes to paint the yellow triangles and filled the body of the bird feeder with a bright blue. To seal in the color and make it more weatherproof, it's best to then paint the entire ware with a clear underglaze and it will then be ready for glaze firing. Once your bird feeder is out from its final firing, then find some brightly colored ribbon or string, loop it through the top of the bird feeder and hang it in a tree (making sure to tie it tightly to one of the branches). Fill it with bird feed and sit back and watch the birds flock to your garden!